This tours will offer you a unique journey in pedicabs that combine anecdotes, historical facts and great fun. These vehicles are electrical, 100% ecological and can get to places where cars can't go so it's a perfect and convenient way to visit a city. All tours include a local guide who will drive you during the tour and explain you all kind of historical facts and anecdotes. This tour is ideal to go with family, friends or work colleagues. 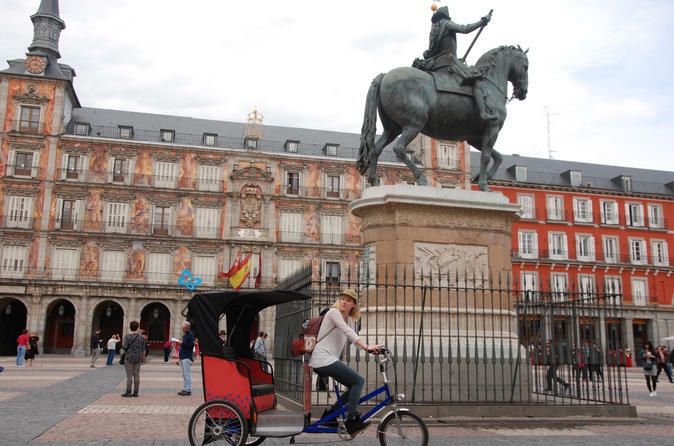 - Discover Madrid: the tricycles are perfect to visit Madrid's city center and take some pictures with its panoramic roof! Don't walk and let your guide take you to the most important and cultural places. Tour around: Neptuno, Appolo, Cibeles, Puerta de Alcalá, Retiro Lake, Palace of Glass, Cuesta de Moyano, Botanic Garden, Prado Museum, Huertas, Plaza Santa Ana, Plaza Mayor, San Miguel Market, Plaza de la Villa. - Romance in the Jungle: A romantic tour around the Retiro Park! Bring your partner and let your love flow during 60 min tour. You will see places like:Neptuno, San Jeronimo Church, Puerta de Alcalá, Retiro Lake, Palace of Glass, Rose Garden,Cuesta de Moyano, Botanic Garden, Prado Museum. - Safari in the Retiro Park: Visit the most famous park about Madrid. Have a nice 1h ride and enjoy its nature, monuments and discover all its secrets! You will go around: Neptuno, San Jeronimo Church, Puerta de Alcalá, Retiro Lake, Parterre Square, Palace of Glass, Rose Garden,Cuesta de Moyano, Botanic Garden. - Excursion through the centuries: For those who are curious about history and architecture. This tour will show during 60 min the evolution from Madrid since the medieval period until nowadays. You will go through places like: Neptuno, Prado Museum, Huertas, Plaza Santa Ana, Plaza Mayor, San Miguel Market, Plaza de la Villa, Almudena's Cathedral, Royal Palace, Congress of Deputies.